Portait de Franz Liszt par Wilhelm von Kaulbach. 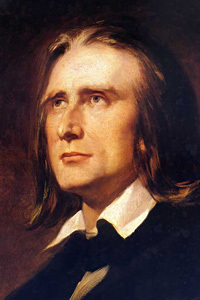 Hungarian piano virtuoso and composer, Liszt studied in Vienna and Paris and was on the concert stage from 1822-48. In 1861 he went to Rome where he became a member of the Catholic Franciscan order. His works include twelve symphonic poems, masses, two symphonies, and a large number of piano pieces. Source: William R. Denslow, 10,000 Famous Freemasons, 1959.